Maj. Gen. Claude Reinke, USMC, Ret. 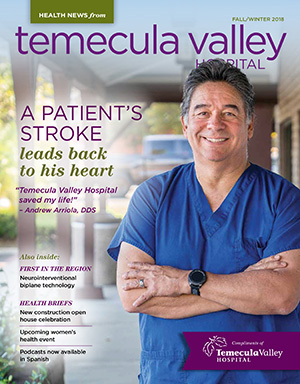 Health News from the Temecula Valley Hospital is a publication designed to bring you the latest news as well as health and wellness information you can use throughout the year. You can read the latest issue here, or sign up to have Health News mailed directly to your home. When Andrew Arriola, DDS, suffered a stroke, doctors discovered a surprising underlying cause. New technology offers expanded treatment options for stroke patients. Ask the doctor: Joshua Leichman, MD, Cardiac Electrophysiologist. The commitment to patient safety at Temecula Valley Hospital continues.